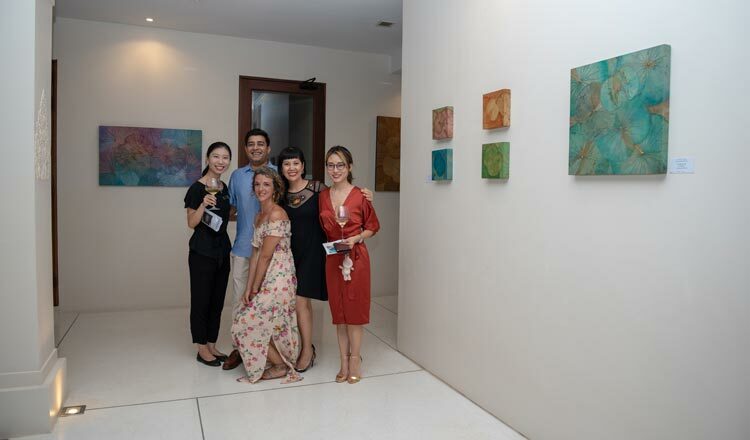 Phnom Penh-based Spanish expat Sara Da Riva launched her debut exhibition titled, ‘From Mud Comes Beauty – Lotus Leaf Art’, at the swish Anantara Angkor Resort last Friday. Sara’s exquisite gem-like work combines the beauty of natural lotus leaves and botanical illustration, and her exhibition runs until June 21. Anantara Angkor GM Sarah Moya says the hotel was looking for unique set of art to exhibit and to represent the coming green season. Artist Sara, who used to run an art retreat and guesthouse in Kep, is now focused fully on her art. “I always loved art, especially botanical illustration,” she says. “I started studying more seriously once I arrived in Cambodia ten years ago, and I fell in love with the lotus flower and leaf. “My love for lotus leaf art started around four years ago in Thailand and in Bangkok I discovered my unique style. Meanwhile, on the other side of town, One Eleven Gallery co-owner Danny Melham – a former Aussie government project manager who moved to Siem Reap in 2016 – figured that while he was showing people other artists’ works, he may as well try to work on producing his own art. “I really started painting last year,” he says. “That’s was the first year I really took it seriously. Proof of Danny’s newly-emerged digital talent is now on display at his first exhibition of nine works, collectively titled, ‘Through the Prism’, at the One Eleven Gallery. 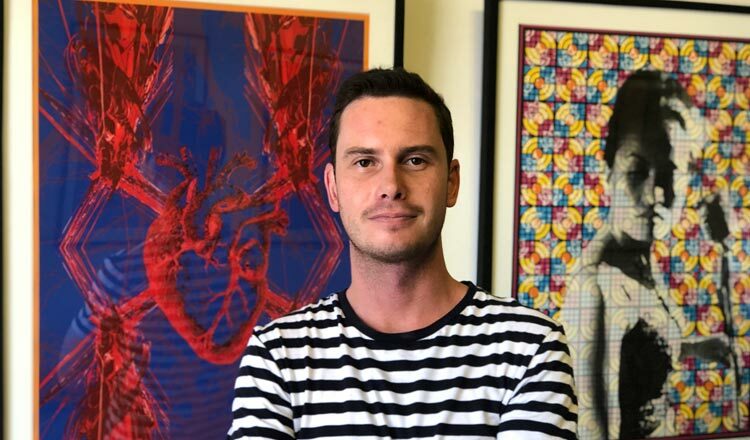 He combines cool graphic imagery on a background of patterns inspired by the colonial tiles found mostly in the Kingdom’s older building, and his exhibition runs until May 14. Also madly wielding a paintbrush is British-expat, sexagenarian Richard Oatley, who’s been knocking around Cambodia nigh on eleven years and has settled in Siem Reap working as a teacher at King Glory International School. While he’s worked in house décor and graphic design, he’s never really simply painted, and now he can’t stop. But his work cannot be viewed in a gallery, as his canvas is the classroom wall where he teaches. And his mural work isn’t viewed by gallery goers, but by the grinning, spinning, whizzing little people he teaches who high-five each other and giggle in front of his mural master and lap up the quaint little ditties, or poems that Richard also writes to accompany the imaginative characters in his mural. “My working life has mainly been decoration of houses for the national trust or very rich men and women,” Richard says, “I was employed once by Lady Lloyd* in Hampshire to decorate an inside loo and the outside of her house because she was holding a garden party for Lady Thatcher… Lady Lloyd used to clean my overalls for me. Such a nice lady. 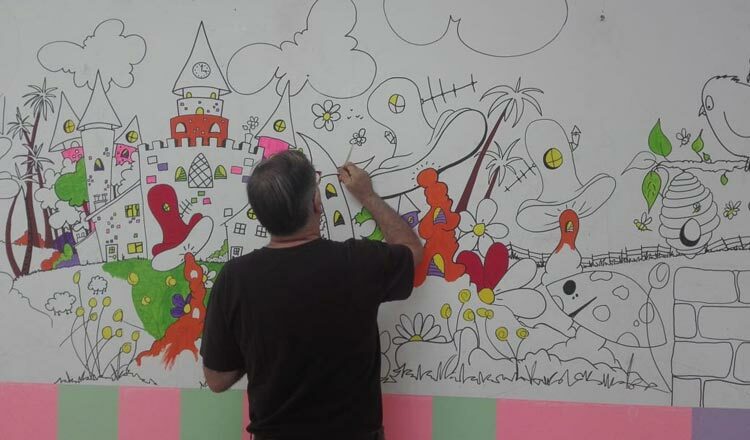 Richard recently began painting his mural at the school after encouragement from the kids. “The inspiration came from the children really,” he says. “I had been designing educational bits and pieces for my class and they included quick line drawings that I allowed the children to colour when they had completed their work. “They always wanted more. So when I was given the large classroom, it was just so empty of feelings, bare and blank. I changed all that to make it a welcoming room full of life and colour. My class like copying my work and so do the other classes – I think it inspires them to think outside of the box. *The real Lady Lloyd, not the drag queen version.